The traction works pretty well indoors but exceptionally well outdoors, a good number of testers observe. Nearly all reviewers are impressed with the uppers of these Nike shoes. They are saying that the materials do not require any break-in time and are soft enough to conform to your foot. For its price, the Nike Zoom Shift is a great basketball shoe according to a handful of purchasers. Most wearers are pleased with the lockdown and support that these Nike basketball shoes provide. They do not experience any heel slippage and are content with the overall containment. The Zoom Shift seems like a guard shoe because of its light and responsive feel, several testers assert. According to a few wearers, the shoe fits true to size and feels comfortable while walking. A significant number of buyers are not happy with how the Zoom Shift fits. They are saying that it’s disappointingly small and tight. A few are not able to put the shoes on and had to return it. The cushioning is really stiff according to several reviewers. One tester even compared it to a brick because it feels very dense and hard, hurting his feet every time he plays in it. A few testers complain that the traction is terrible. They claim that the pattern collects dust so fast it causes you to slip a lot. Therefore, frequent wiping is recommended. With a slew of affordable basketball shoe releases, there have been a few misses and several hits from Nike this 2017; and the Nike Zoom Shift falls right in between. Its basic cushioning setup, tight fit, and mediocre traction don’t make it a great choice for competitive hooping. 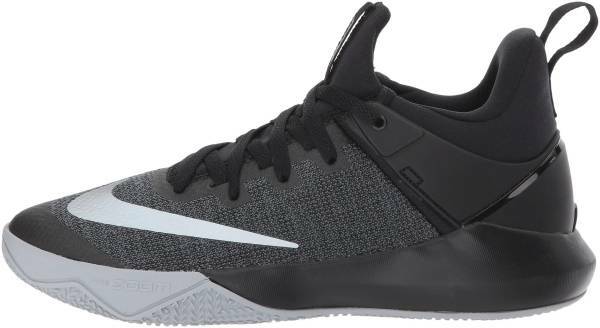 There are a number of better performance sneakers (including signature shoes such as the Nike PG 3 and Adidas Dame 5) at the same price range. I enjoyed playing in it. I don't think the performance is worth $100. It may not cater towards my playstyle completely but I can definitely see lots of players like these, especially those who are looking for a very cheap shoe to wear and tear. Personally, they got every single aspect you would need on court as being a guard. Zoom past the defense as you shift to top speed with the Nike Zoom Shift. Engineered for quickness to suit today’s fast-paced game, the Zoom Shift features a lightweight mesh upper and a Zoom Air bag that delivers cushioned comfort and incredible stability as you cruise all over the court at high speeds. Cushion. The Nike Zoom Shift features a Phylon foam midsole that adds cushioning, offering supportive comfort ideal for quick jumps and landings while a forefoot Zoom Air unit delivers a responsive ride on-court. Traction. The durable outsole of the Zoom Shift delivers on-court traction through a rubber tread pattern that wraps up its sides, enhancing grip during lateral movements and high-speed cuts. Length and Width. The Nike Zoom Shift reportedly runs small and narrow. Buyers are advised to go up half a size, but it is still better to try the shoes in-store first before purchasing. Lockdown. With a mid-top bootie construction and molded heel counter, the Zoom Shift offers comforting support while its dynamic webbing system provides an adaptive lockdown. The Nike Zoom Shift has a lightweight textile upper that features mesh throughout for breathable comfort. The combination of mesh and textile improves ventilation, keeping your feet comfortable and fresh while you are working up a sweat. The Nike Zoom Shift’s unique design packs just enough technology to make it formidable on-court while still being cool and comfortable to wear on the streets. Its mid-top silhouette has pull-loops on the heel and tongue to help with easy on and off while a padded footbed adds comfort. Capping-off its contrasting colors is the prominent Swoosh branding on the lateral side of the forefoot that extends to the midfoot. Joining in the fight against breast cancer, Nike released a particular colorway dressed in white and pink. Constructed with a white mesh upper, the Nike Zoom Shift “Kay Yow” is treated with accents of vivid pink, honoring Kay Yow’s bout with the disease.